Titans according to Greek Mythology were six elder gods named: Cronus, Coeus, Crius, Iapetus, Hyperion and Oceanus, who ruled the cosmos before the Olympian gods came to power. 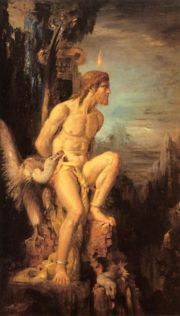 Cronus, The King of the Titanes, led his brothers in the castration of Uranus, and was himself deposed by his son Zeus. The Pelasgian tribes of Thrace were said to have been born from the blood of Titans. The sisters of the Titans, Rhea, Theia, Mnemosyne, Themis and Tethys, were known as "Titanides". The main sources of this mythology are: Homer, The Iliad - Greek Epic C9th-8th BC and Hesiod, Theogony - Greek Epic C8th-7th BC. Dictionary of Greek and Roman Biography and Mythology. This page was last modified on 12 September 2016, at 19:27.